Hello! My name is Tom, and I worked as the design intern at this year’s Supersonic festival. I should start by saying how much the internship helped me out. Before working with Capsule, I was spending most of my time hunched over my desk, drawing small pictures on small pieces of paper. That was pretty much all I did, and after doing that for a few months, I became aware that it was possibly doing me more harm than good. It felt like I wasn’t really accomplishing anything anymore. I guess I was suffering from some variety of ‘artist’s block’, which I appreciate makes me sound like a monumental prat, but I can’t think of a better way to put it. The design internship seemed like just the opportunity I needed to make some new work and learn some new skills, so I figured I would give it a shot and send off an application. I was over the moon when Capsule offered me the position. My first project was designing an issue of the Capsule fanzine. After doing that, I designed a few posters for some upcoming Capsule shows before concentrating on Supersonic. 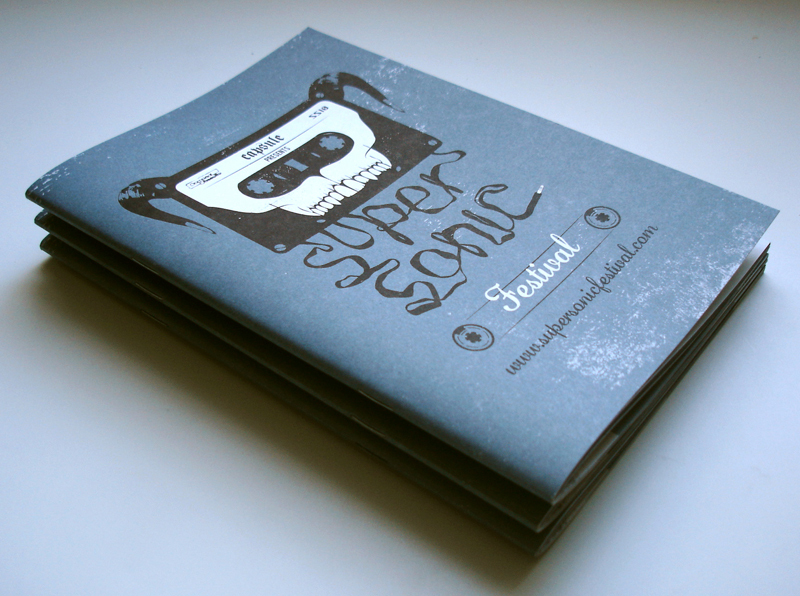 The biggest project for me was designing the Supersonic festival catalogue, which I worked on with Ian Richards of Heavy Object. A heck of a lot of drawing, cutting, tracing, typesetting and spell checking went into making the catalogue, and I couldn’t be happier with the result. It was a really enjoyable project to work on, and immensely exciting to see catalogue progress from being a bunch of files on a MacBook to 2,000 properly printed books. I also worked on decorating the festival site. If you got yourself a cup of something at any point during the weekend, then you may have seen some my work pasted up on the walls of the tearoom. 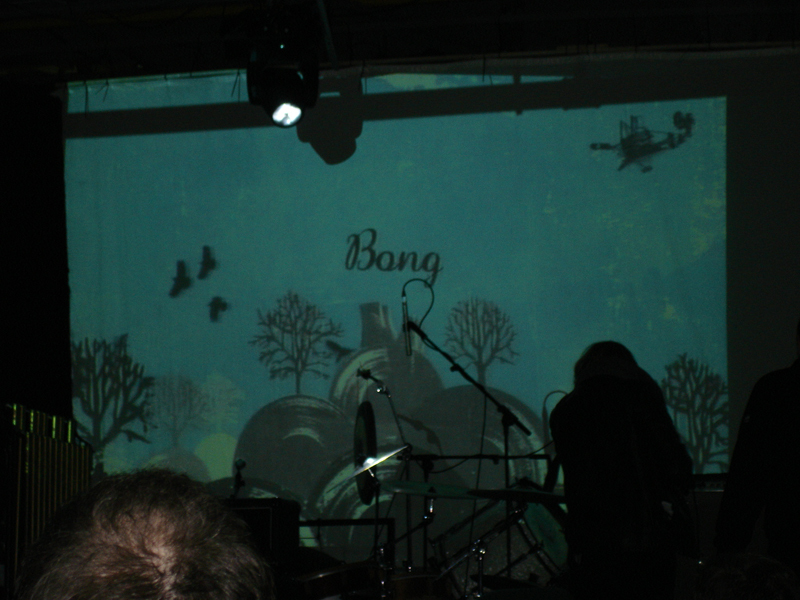 You may also found yourself watching the animations I helped put together on the big screens in the venues whilst you were waiting for your favourite band to come on. During the festival weekend, I had the pleasure of helping out the Black Sun Drum Corps. They put on an incredible performance on Sunday evening. It was definitely a highlight of the festival for me. It was great to see everyone involved get really into it, to the extent where some of the participants didn’t take their make up off for the rest of the night! Other highlights of the festival included seeing Eagle Twin, eating a chickpea curry whilst watching Tweak Bird, witnessing Bong play one of the most atmospheric and captivating sets I’ve ever seen any band play, finally getting my hands on Alan Moore’s Unearthing album from the Rough Trade stall, and of course, Swans! The internship has been a great experience, and I would like to thank Capsule for giving me the opportunity to work with them for the last few months. I can’t wait to see what they’ve got up their sleeves for Supersonic next year now, October 2011 can’t come quickly enough! If you’re interested in being an intern for Supersonic 2011, check the Supersonic website for updates next year.